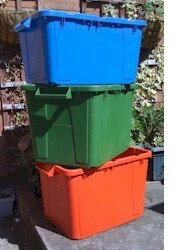 What can GreenBoxDay do to get your council's refuse and recycling message across? "I have no doubt that coupled with an effective communications strategy this contributed to the staggering surge in performance which saw recycling rates in the area double." Shropshire Waste Partnership. How does it GreenBoxDay work? GreenBoxDay.co.uk is a practical and proactive tool that a growing number of local authorities are already taking advantage of, helping them automatically remind residents of weekly and fortnightly kerbside recycling and refuse collections. Your council may normally communicate waste and recycling collection information by publishing an annual calendar, issuing press releases about collection changes to the media and including details on your website. However, GreenBoxDay complements those communication channels by directly engaging your residents on a weekly basis. Click here to register your council's interest in GreenBoxDay. Users (your residents) simply register by visiting the GreenBoxDay.co.uk website, entering their postcode details, email address and choosing a password for their profile. No other information is required. They can then very easily activate a series of automatic and regular reminders for each individual collection, giving them advance notification so they can organise their recycling and make it ready for the kerbside. Information provided in the registration process is totally confidential, secure and never made available to third parties without consent. Collection data is provided to GreenBoxDay by the council and integrated into our growing UK-wide system. Any changes or additions to the data can be managed by GreenBoxDay on the council's behalf. However, we're currently developing the system to allow councils to manage the data directly themselves online. GreenBoxDay reminder emails contain information on the date, time and type of collection in their area - general waste, garden waste and recyclables. However, it offers the council the option of communicating specific information to registered users. For example: advanced notification of collection changes during bank holiday periods, special recycling campaigns and events or information on recycling centres. A paid-for text messaging service option is also available to registered users. Registered users are regularly reminded to be organised for their collections and put out the appropriate refuse and recycling bins and boxes. Because of the direct-access nature of the service, we can help you raise awareness of your environmental policies and communicate the latest environmental information instantly. Working with you, we can help raise awareness in your local media, as well as collaborating with you on articles for council or related publications. To this end, we believe it is crucial that councils are encouraged to promote the GreenBoxDay website link on their own websites to help raise awareness of kerbside collections and the email service. It's a win-win formula which helps local authorities towards achieving recycling targets, as well as educating residents on the important refuse and recycling issues in their area. The GreenBoxDay email service is free to end users and free to councils provided they promote the service and include visible links to GreenBoxDay.co.uk on their website. In some circumstances we reserve the right charge a fee where significant work is required to transform collection data - however any charge would always be agreed beforehand. End user opting for the SMS reminders pay 25p for each text message reminder they receive to their mobile phone. This is explained at every stage and each message sent includes the instructions to leave the service. James Thompson, Waste Prevention Officer, Shropshire Waste Partnership: "As part of the introduction of alternate weekly collections in Shrewsbury we began working with GreenBoxDay to ensure residents were up to speed on their radically revised collection schedules. The system proved simple and popular with residents and I have no doubt that coupled with an effective communications strategy this contributed to the staggering surge in performance which saw recycling rates in the area double." "The system is not only about reminding people of their collection day, by also drip feeding them additional information such as waste minimisation advice it contributes to improved participation and capture rates." "GreenBoxDay also augments the Councils e-governance strategy and demonstrates our commitment to using ICT to deliver essential public services more cost effectively and intelligently. It shows how we can embrace the environmental agenda to actually develop new business opportunities and ensure our areas develop as low carbon communities with enhanced economic capability." We take any feedback very seriously and we're always keen to ask what registered users think about us so we can act on those comments and improve the service. All feedback to date tells us that people are very positive with how GreenBoxDay works for them and how it keeps them informed. "I find the reminders very useful, and in truth would not re-cycle if not reminded. I also like the fact it tells you (yes I do need reminding every message) what to put in what bin. Before I used to wait till my neighbours put out theirs but this is a better system. I have told all my friend about this service." "Really good, a very easy to use service. Much better than other cities!" "The reminders are great, I work long hours and always forget which week it is. It is very useful"
"The reminders are excellent. Especially about the brown bins. Thank you. Keep up the good work." "Thank you very much. They ensure I never forgot about the recycling - provided I check my email!" "Just a quick note to say how useful I find your Waste & Recycling Collection Alert service. Since I signed up for the Emails, I have never missed a collection date even over the Christmas and New Year periods. Keep up the good work!!" "Yes, fantastic idea - no way I would have remembered otherwise! Going to leave details for new owner." "We should enter you for an award this is a good service you have set up." "It is good to be reminded early so that I get out into the garden and fill the bin in preparation - rather than being reminded by seeing bins on the street on the day of collection when it would be too late. I also used to put out a neighbours bin." Need more information, or want to get involved with GreenBoxDay? GreenBoxDay is being rolled out across the UK over the next two years. We want you to be involved, so click here to complete the council enquiry form and we will contact you and get things moving in your area! Save on your electricity bills by installing low energy light bulbs throughout your home. Present clothes banks are only operating at about 25% capacity.